On Thursday morning, June 19, Burlington's Switchback Brewing (160 Flynn Avenue, 651-4114) will open a new-and-improved tasting room to the public. The expanded room will be open every day but Sunday and pour the brewery's flagship ale while rotating through seasonal selections on eight draft lines, according to co-owner Bill Cherry. This week, look for four beers on draft, including a newly released extra pale ale, a hop-forward brew made with whole-cone hops, or the more familiar Roasted Red Ale, a Slow Fermented Brown Ale and Dooley's Belated Porter. * Cherry says early birds can sip the extra pale on cask for as long as it lasts for “a little extra celebration” to commemorate the opening. The new room, Cherry says, is bigger and brighter than the old one. 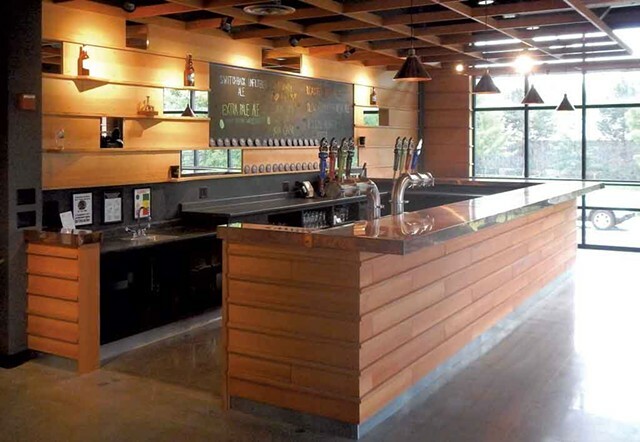 The previous tasting area "was kind of this dark little place," the brewer says, adding that Switchback's renovation reflects the expanded scope of a modern tasting room's functions. While such rooms were once about selling merch and filling growlers for transitory customers, he explains, today's visitors want to do more than just gas and go. "They want to come and visit and talk and taste," Cherry says. "The public has really changed what it expects from a brewery visit ... Now you can sit down and order a pint and relax and get a feel for the brewery." So Switchback increased its footprint to welcome the conversation. "We took over more space in the building and busted out a wall to make a big, nice, open room," Cherry says. "There are tons of windows ... I was obsessed with letting the sunlight in." Switchback will celebrate the grand opening of its new tap room this weekend. See the Facebook event for more information. *Correction 06/19/14: An earlier version of this article stated that the extra pale ale was made with Vermont hops. In fact, a pilot batch of the brew used local hops, but the full release does not.